Carlingford House has recently been awarded 4* classification from Failte Ireland. 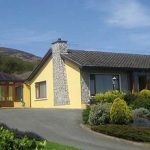 Recognised as one of Carlingford’s most luxurious Guest Houses, it is truly a magical residence, that blends the warmth of a country home with the style and luxury of contemporary accommodation. Overlooking the ruins of Carlingford’s Dominican Friary, a well known location for wedding photos. 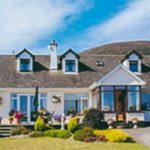 A beautiful destination offering warm and comfortable guest accommodation with off street parking and within walking distance of all local amenities. Lovely Georgian House, warm, cosy and friendly family run home with off street parking. 5 en-suite rooms. All with T.V/Radio, Hairdryer, and Hospitality Tray includes Tea/Coffee, Biscuits, Chocolate and Still Water. Free Wi-Fi in all rooms.